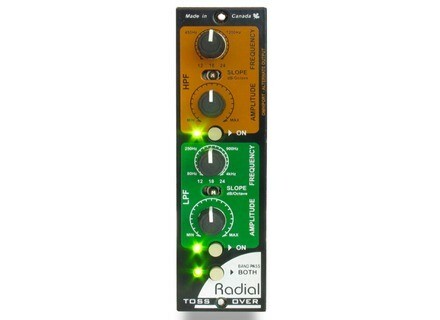 Tossover, Other Studio Effect from Radial Engineering in the 500 series. This enables you to separately process lows and highs or combine the two in series to create a band-pass filter. The front panel sports two sets of controls whereby one set is focused on the mid and high frequencies, while the other separates the mid and bass frequencies so that each can be processed individually. The frequency knob lets you adjust the cut-off point and the amplitude knob is used to adjust the signal level. To intensify the effect, each frequency divider is equipped with a three position filter that may be set with a 12, 18 or 24 dB per octave slope. This enables the Tossover to also work double duty as an elaborate filter to either warm up tracks or reduce unwanted resonance. A handy front panel switch enables the two filters to be combined in series to create a band-pass filter to enhance the mid-range on a lead guitar track or make a snare stand out. The Tossover may be used with any 500 series rack via the XLR in/out connections. When used with a Radial Workhorse, the functionality is enhanced by allowing both of the frequency bands to be processed simultaneously whereby the low-pass filter stem can be directed to the XLR out and the high-pass filter stem sent to the Omniport. A miniature slider switch near the card edge connector allows the user to toggle the output as needed. The Tossover is now shipping. Estimated retail price: $400 USD. Check out Radial Engineering for more details. Radial Engineering Submix Radial Engineering announces the Submix 4x1 mixer, the latest in the company's family of 500 series modules. Lynda.com Audio Recording Techniques Video training site lynda.com has added a recording course to its audio curriculum, and is offering about an hour of free training. Roland M-200i iPad Controllable Console Roland is introducing the Roland M-200i, designed to be controllable with an iPad.